Using the AWS Management Console, you can deploy high-quality cloud desktops for any number of users. Complex infrastructure that is difficult for IT to plan, configure, manage, and maintain. Unfavorable economics that tip ROI equation in the wrong direction with un-utilized capacity, heavy upfront costs and cumbersome ops. Time-consuming implementations that involve multiple IT disciplines and months of planning, testing, and staging of infrastructure. Difficult root cause analysis among multiple IT teams. Employees not tethered to traditional desktops or laptops. Ability to meet security policy requirements and compliance standards by using protocols to compress, encrypt, and encode data so only images are transmitted and data no longer resides on local devices. Enables creation of developer-style environments, granting developers quick an secure access to end-user environments for seamless dev testing, without impeding user productivity. 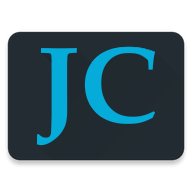 Allows devs to move fast and fail fast with access to desktop resources when they need them. Keeps business data secure, centrally managed, and accessible to users. Places productive workspace in the hands of end-users near instantaneously, while supporting secure access from multiple device types. Manages apps centrally with the ability to securely package, deploy, and maintain a productive user environment. 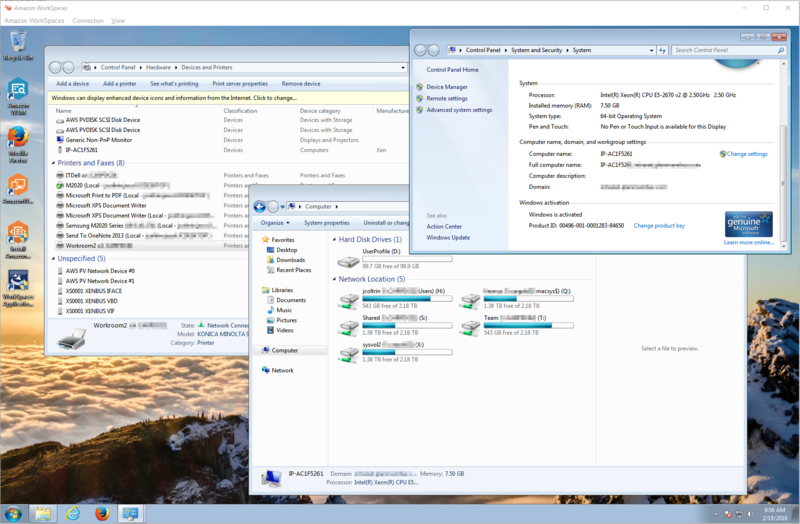 Deliver a productive environment for users without the task of configuring a desktop asset. *Note, our org already has a VPN connection between Amazon AWS and our On-Prem domain and domain controllers. This allows me to find our domain with Amazon’s connector. 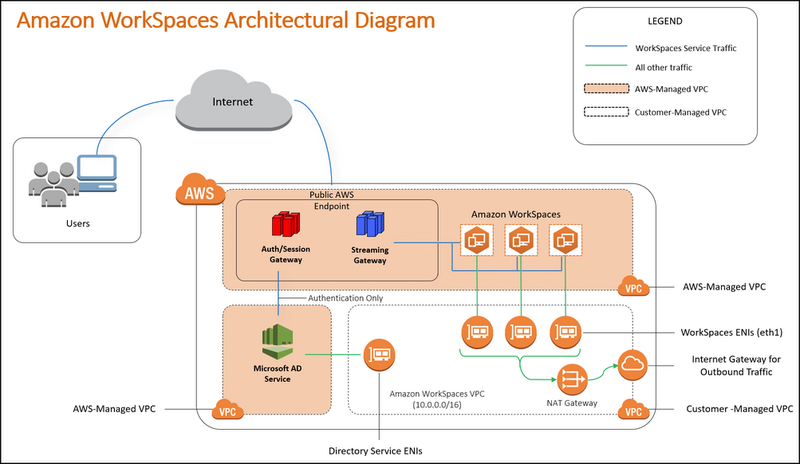 Review the Architectural Diagram below to ensure you’re comfortable with how Workspaces can fit into your AWS presence and VPC’s. If you have any issues connecting to your WorkSpace, please contact your administrator. Deploy to a set of users. Rent before buy, buy before build. Multi-Region vs Single Region – within each region are availability zones. One workspace is not available in all regions. When building VPC, figure out which subnets support workspaces. Subnets are fixed, build to allow for growth. Workspaces are attached to AD connectors. You cannot move an old Workspace between AD Connectors. 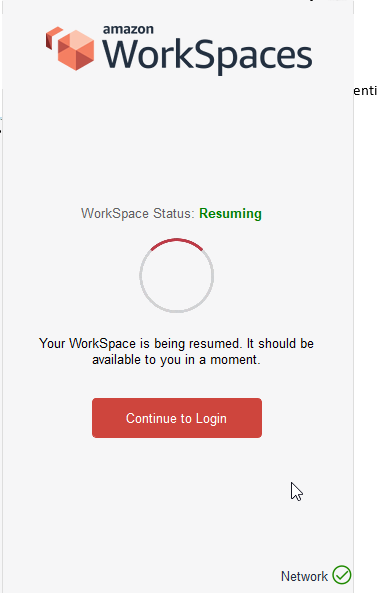 If availability zone becomes unavailable, then workspaces are unavailable. Use multiple availability zones to allow for this. Only allow windows devices with certificates to connect. Etc. You’re going to have several AD connectors. Have a production AD connector and a testing AD Connector. Setup pure sandbox somewhere else for testing. Each AD connector drops the computer into single OU, options are separate AD connector per department. Eg. Only accounting can connect from a certain dept. 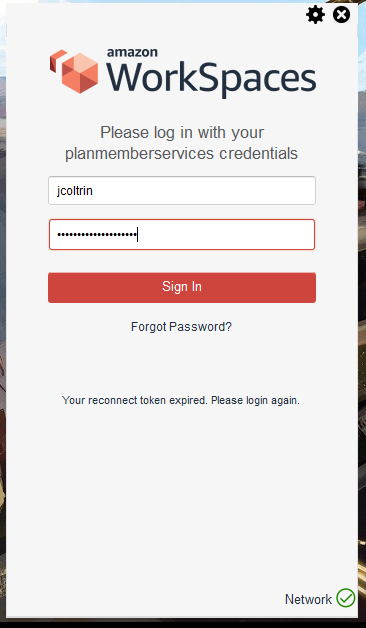 Or you cannot auth from outside, only on-prem. Create AD connector for consultants which drop them into separate subnet, monitoring. Workspaces IP addresses stay there forever. IP addresses persist on rebuild etc. Cannot assign IP’s. Better segregation between work and personal side of things. BYOD is nice – pane of glass. Devs have good separation. Reduced operational overhead, light-weight devices, drop them in mail ready to go. Send the registration code. People are lining up to get onboard. Tougher to please users are ecstatic about workspaces. Once implemented, IT itself will not go back to before. Hoteling/shared workspace areas. Smaller sites only need internet connectivity, not a WAN-enabled site. Cost savings – financial benefits – get out of the business of providing physical PC’s, building and configuring VDI service is complicated and costly, focus on service not infrastructure. Enable end users – automate the whole thing & allow user to migrate their data. There are two main options for Workspaces, Monthly pricing and Hourly Pricing. At 160 hours per month, a “Performance-grade” workspace under the Hourly Pricing model would cost $7.25 + $0.57/hour = $98.45. The same “Performance-Grade” workspace under the “Monthly” pricing would cost $55. So it would take approximately 1 1/2 years of monthly payments to reach the cost of a normal desktop PC. Overall, I really like Workspaces, it was simple to setup and run. I believe the remote workspace from AWS can work very well for the enterprise and provides a flexibility to expand, create different images for different users easily and keep data safe at AWS by only sending graphics/pixels over the wire. People can use their own BYOD devices such as Chromebooks etc. to perform their jobs. The only drawback I’ve encountered is workspaces does not provide a pass-through video / camera devices for Skype video calls. If a user needs to use Skype or other video conferencing, they will have to start their call “outside” of Workspaces. Let me know what you think about the product and this write-up. Thanks for this write-up. I’m currently in the early stages of a VDI POC and I found this to be very helpful. Glad to hear the info helped. We rolled it out in a limited degree and so far it has been perfectly fine. For some users it’s a little confusing because they’re not used to a remote desktop, but for most it’s ok. Providing the workspace to contractors is wonderful because we can limit data leaving our network.